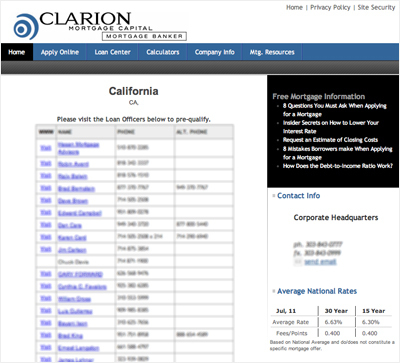 Visitors will enjoy how easy it is to locate a loan officer from your website! The Virtual Lender Enterprise solution comes complete with a Enterprise Dashboard (Group Control Center) a Primary Virtual Lender website and the powerful Dynamic loan officer/branch search engine. The loan Officer Search Engine has been designed to be integrated seamlessly into an existing corporate website as a mortgage module or work seamlessly with your Virtual Lender Enterprise Website. This is particularly popular with our banking and credit union clients who manages multiple locations from a single website. 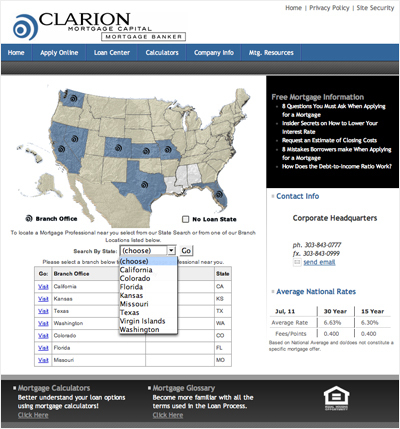 When a visitor lands on your company website they have the option of locating a branch or loan officer to work directly with. Depending on your configuration option the borrower will be presented with a list of the brach locations within the states you are licensed in. After selecting the branch location they are then directed to a list of the loan officers within that branch. The visitor will click on the loan officer's VISIT link to access the loan officer's personal mortgage website and begin the application process. You have the option of directing the visitor to the loan officer's website or directly to the loan officer's loan application. 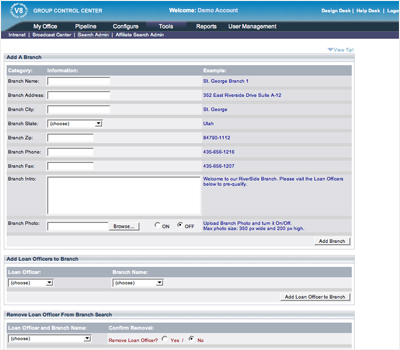 Configuring your Loan Officer Search Engine is a snap! Simply login into your Dashboard utility and begin the configuration process. 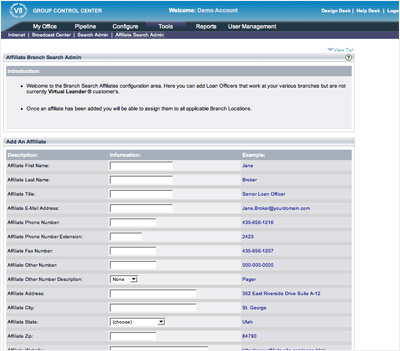 To start you would add the branch locations and then assign the loan officers to their respective branch. In the event that you have some loan officers that have not taken advantage of the World Wide Web you can list them as Affiliates (loan officers without websites). They will appear in the Loan Officer Search without a link to a website.